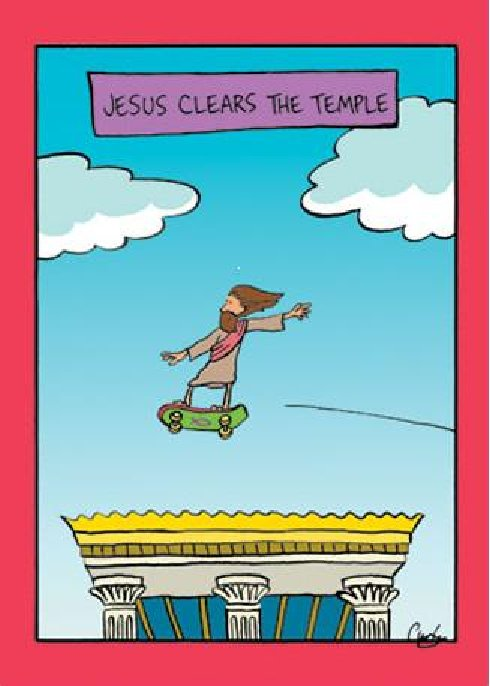 A member of Resurrection sent me this cartoon today: “Jesus clears the temple.” * The cartoon got me thinking about the story in Jesus’ ministry (Mark 11:15-18). For many of us, the fact that Jesus cleared the temple of money changers is not significant or meaningful. We don’t realize how upsetting and radical Jesus’ action was for the ruling religious council in Jerusalem. We often see Jesus’ angry expression as some sort of deviation from the nice, kind Jesus we adore. It was sort of “bizarre,” like someone “clearing” the temple on a skateboard. Second, Jesus’ radical and counter-cultural agenda, subverting both the political status quo and the movements of violent revolution, was focused in his awareness, of vocation. John the Baptist re-enacted the Exodus in the wilderness; Jesus would do so in Jerusalem. Jesus’ gospel message constantly invokes Isaiah 40-55, in which God returns to Zion (Jerusalem), defeats Babylon, and liberates Israel from her exile. At the heart of that great passage there stands a job description. This would be the victory over evil; this would be the redefined messianic task. Jesus had warned that Israel’s national ideology, focused then upon the revolutionary movements, would lead to ruthless Roman suppression; as Israel’s representative he deliberately went to the place where that suppression found its symbolic focus. He drew his counter-Temple movement to a climax in Passover week, believing that as he went to his death Israel’s God was doing for Israel (and hence for the world) what Israel as a whole could not do. Third, Jesus believed something else, I submit, that makes sense (albeit radical and shocking sense) within precisely that cultural, political, and theological setting of which I have been speaking. Jesus evoked, as the overtones of his own work, symbols that spoke of Israel’s God present with God’s people. He acted and spoke as if he were in some way a one-man, counter-Temple movement. He acted and spoke as if he were gathering and defining Israel at this eschatological moment—the job normally associated with Torah. He acted and spoke as the spokesperson of Wisdom. Temple, Torah, and Wisdom, however, were powerful symbols of central Jewish belief: that the transcendent creator and covenant God would dwell within Israel and order Israel’s life. Jesus used precisely those symbols as models for his own work. In particular, he not only told stories whose natural meaning was that YHWH (God) was returning to Zion, but he acted—dramatically and symbolically—as if it were his vocation to embody that event in himself. Jesus saw himself as the means of salvation, no longer the Temple as the means. He became the sacrifice for our sins. He cleansed not only the Temple, but our hearts so that God can live in us. Amen. Lord Jesus, continue to cleanse us. This entry was posted in Bible, crucifixion, Jesus, story, theology and tagged N. T. Wright, symbolic action, Temple on April 3, 2012 by Pastor John Keller.